Running this blog is pure fun for me (except times, when competitors want to sink my website) – I test make money online opportunities, talk to interesting people and get satisfaction from knowing that I help people start working from home. Communication with my readers is a great way to improve my website and find new sites to make money online for free with. Recently one of my readers asked to write more follow-up reviews with payment proofs of mine. Just now I received a payment from MinuteWorkers.com, which is my favorite site for earning money by completing micro freelance jobs. 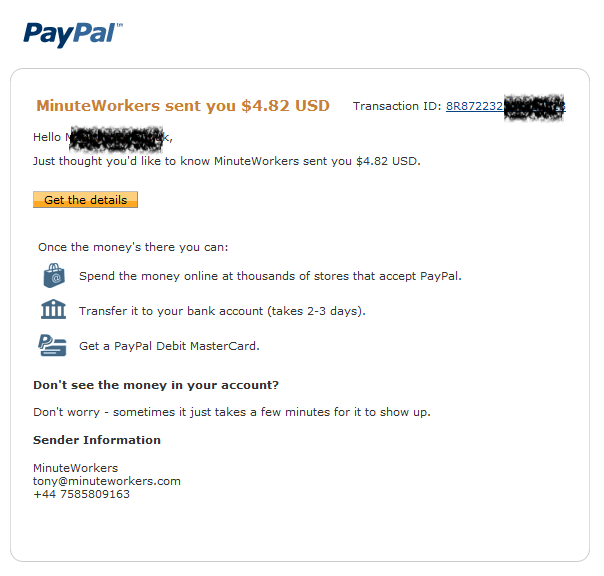 Even though the sum is not very large but still I needed some money in my PayPal account badly, so MinuteWorkers has helped me a lot by letting me make money online for free in a matter of several minutes. How to earn with MinuteWorkers.com? My payment proof from MinuteWorkers.com is to be included later in this post but now let’s take a look at which earning opportunities this site can offer. Previously I wrote one interesting post – what’s the fuss with making money with micro freelance? and now I see that I was absolutely right back then, micro freelance jobs do work. At MinuteWorkers.com you can register and start making money by doing your daily Internet tasks: complete surveys, download files, check out websites, follow on twitter, exchange blogroll links, become someone’s referral, watch videos on YouTube, ect. Personally I earned several dollars in less than an hour, it is a very easy way to make money online but MinuteWorkers.com won’t make you super rich. Right now there are several hundred tasks to take and they pay from $0.2 to $4 per task. Additionally you can refer your friends and make extra money with your referrals. Users make up to $0.2 for every new member, who joins MinuteWorkers.com and starts using it for making money. Recently I got to chat with the owner of MinuteWorkers.com, who treats his business seriously. At MinuteWorkers.com you need just 2 dollars in order to get a payment (either via PayPal or AlertPay). Payments are completed on weekly basis. With the help of their forums you can discuss other ways to earn money online and get paid to post on forums. Rates are not high but something is always better than nothing. I hope you enjoyed this post and would be able to make money with micro freelance jobs in no time. Please subscribe to IncomeBooster.org, follow me on Twitter and like us on FaceBook.com. You can help me a lot with this. Thanks again.